Funcom's Three MMO Worlds Are In His Hands. What Will He Do? Just a few short years ago, Funcom's Joel Bylos was in charge of level 20 through 40 of Age of Conan, a massively multiplayer online game that was, at launch, widely criticized for a lack of quality content past level 20. Now he's the creative director in charge of Age of Conan, Anarchy Online and The Secret World, and his goal is to make unhappy players at any experience level a thing of the past. Earlier this week I spoke to Bylos about his newly-announced role at Funcom, the Norwegian developer that's been very good to the Australian transplant. He was lead designer on the Age of Conan "Rise of the Godslayer" expansion. Then he served as lead content designer for paranormal MMO The Secret World, where he was responsible for some of that game's most innovative and exciting content, including the tough-as-nails investigation missions, which required players to actually do research outside of the game. In September of last year, Bylos was elevated to the position of game director of The Secret World, helping transition the troubled subscription-based game into a more sustainable free-to-play (after game purchase) model. He also proved he wasn't afraid to poke fun at himself, via a series of "End of Days" video logs that cast him as a paranoid nutjob. Late last month, Funcom announced Bylos' newest role — creative director of the company's new centralized live team, a single entity responsible for overseeing development of three very different massively multiplayer online games. Now that former creative director Ragnar Tørnquist has gone off to work on his dream project — the Kickstarter-funded Dreamfall Chapters — Bylos is the man in charge. I was saddened to learn that, of Funcom's three major MMOs, Anarchy Online is the one Bylos has played the least. When I realized he wouldn't get any of my Leet jokes, I nearly scrapped our interview altogether. But I soldiered on, just as Funcom did when Anarchy Online's 2001 launch was heralded as the worse MMO launch of all time. We're talking SimCity-level issues here. Servers didn't work, registration didn't work, and billing didn't work. Funcom spent six months fixing Anarchy Online following the disastrous launch, and it grew into an excellent MMO that claimed a good two years of my life, but those initial missteps cost it what might have been a truly massive following. "Funcom is pretty aware and open about the mistakes it's made," Bylos said of the Anarchy Online launch problems. When the company launched Age of Conan in 2008, a big red line was placed on a monitor, representing the largest number of concurrent players enjoyed by its predecessor. "We passed it 20 minutes in. It was a big moment." What Anarchy Online lacks in subscriber numbers it makes up for in player passion. The most dedicated citizens of the planet Rubi-Ka have stuck with the game for nearly 12 years. About time they got a graphics upgrade, wouldn't you say? The promised visual update is a priority for Bylos, who told me he'd like to see it implemented this year. He'd also like to give some of the game's mechanics a tweak. "Anarchy Online has a lot of content and things to do. its problems are 12 year-old systems and poor systems balance," said Joel. Age of Conan's problem wasn't stability — it was content. For some reason, an inordinate amount of focus was placed on the first 20 levels of the barbarian-based MMO. The Tortuga starting area was amazing, filled with fully-voiced quests and character driven stories. At one point during development there was a plan to make levels 1-20 their own single-player RPG, with the MMO part kicking in once players were finished. "My job at Age of Conan was 20-40," Bylos told me. "I was basically told 'You've got no voiceover and less guys and you have to make it work.'" It did not work. I played through the opening island a dozen times, but the quality and content gap was too jarring for me to continue long past level 20. That balance has gotten much better since the game was launched, with Funcom sporadically releasing large expansion packs to give players more to do. Bylos' plan is to switch from large expansion packs to smaller content updates on a more regular basis, similar to what's being done in the latest game, The Secret World. "Think every two to three months, instead of every two to three years." Expect to see those two games mentioned in tandem quite a lot in the coming days, as the live team works to align the tech roadmap between the two for more efficient implementation of new features. "The idea is to entwine Age of Conan and The Secret World." The two games run on the same basic engine, so new features added to one can easily be added to the other, a benefit of having a single unified team working on the different titles. "If we bring, say, arena PVP combat to Age of Conan, we can use the same PVP from The Secret World." Keeping The Secret World secret. Keeping it safe. Compared to the previous two titles, The Secret World's launch went pretty smoothly, due in no small part to Bylos' experience on Age of Conan. Not wanting a repeat of that game's uneven experience, as lead content director he made sure The Secret World didn't fall into the same trap. "With The Secret World I really pushed the guys – every area needed to be the same." 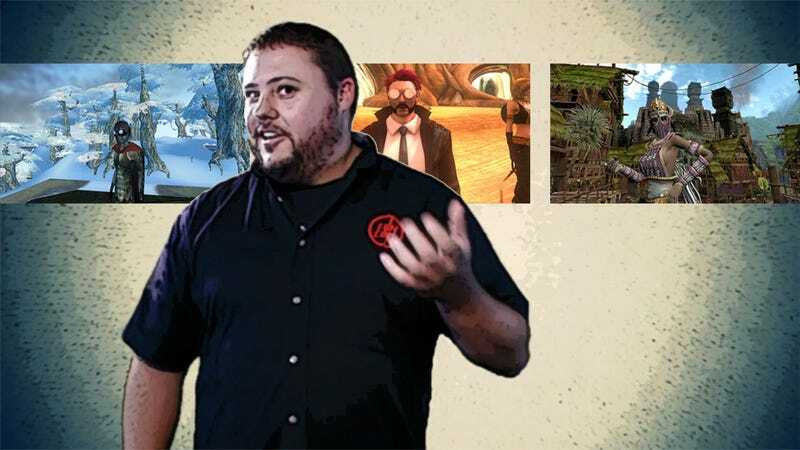 He also pushed MMO conventions, taking advantage of the game's modern-day setting to create investigation missions — a series of quests that involved looking for answers outside of the boundaries of the game world. Many of these were tough-as-nails, especially the one that featured Morse code — not written out Morse code, but an audio sample. Most modern MMOs would shy away from challenging players in such a way. "It treats people like adults," Bylos said of The Secret World's content. "Not a lot of ridiculous hand-holding." The launch wasn't flawless, of course. While the single-server architecture of the game held firm in the face of a massive influx of players, some of the mission scripts didn't fare so well, causing several of the game's more interesting quests to break under the strain. And then there was the underwhelming response to the game from the MMO community. "We were shocked when the game came out — it should have sold better." Bylos felt they'd been catering to an MMO community that something different from the normal class-based MMO, something other than elves and dwarves. Then Guild Wars 2 came out, and players flocked to a game that was, essentially, the fantasy game players seemed so tired of. But The Secret World soldiers on. The recent move to pay-to-own, free-to-play has seen a surge in players, and Bylos plans on keeping the content coming. Regular content updates continue this month with Issue #6: The Last Train to Cairo. Bylos describes Issue #7 as "James Bond vs. Eldritch horrors," which simply sounds delicious. All of this is ramping up to the introduction of a new Tokyo adventure zone, and PVP will be getting a kick in the pants with content that takes advantage of the game's three-faction system. Joel Bylos has big plans for Funcom's three core MMO titles, but his overarching goal is a simple one "I want the games running strong and growing, and I want players getting their money's worth. My vision is to make them run smoothly and keep the players happy. Considering the volatile nature of most MMO player communities, that last one might be a tall-order, but Bylos is confident in his abilities. "I wouldn't have taken the job if I didn't think we could get things done."